The Wildlife Comeback in Europe report marks a reversal in fortunes after hunting, habitat loss, and pollution have sent animals into decline over the past few centuries. The researchers looked at 18 mammals and 19 bird species found across Europe and they found that all, apart from the Iberian lynx, had increased in abundance from the 1960s until 2005. This is one of the highlights of the BBC World Service story Europe’s key animals ‘making a comeback’ about Wildlife Comeback in Europe report released on September 26th. Conservationists say species such as bears, wolves, lynx, eagles and vultures have increased in numbers. They believe that protection, curbs on hunting and people moving away from rural areas and into cities have helped Europe’s wildlife to recover, writes Rebecca Morelle, Science reporter of BBC World Service. She interviewed Frans Schepers, Managing Director of Rewilding Europe, the initiative commissioned the report. “People have this general picture of Europe that we’ve lost all our nature and our wildlife. “And I think what the rest of the world can learn from this is that conservation actually works. If we have the resources, a proper strategy, if we use our efforts, it actually works,” Frans Schepers says. BBC World Service team has interviewed Frans Schepers and Davor Krmpotic, Rewilding Velebit Coordinator in Croatia and witnessed the comeback of the Croatia’s brown bear depicting with a vivid example the success story of the rewilding. Those who tire of being told they are the planet’s most destructive animals will be heartened by a new study showing that dozens of endangered species are making a remarkable comeback in Europe, Ben Webster writes in the article “Animals return from the brink of extinction” in The Times. The white-tailed eagle, grey wolf and brown bear have all recovered from the brink of extinction, according to the first comprehensive study of the comeback of certain species across Europe. Another success story revealed in the study, is the White-tailed eagle, Voice of Russia UK reports. In the past, prejudice made many feel threatened by the large bird of prey, causing it to be widely persecuted. Persistent chemicals in the environment known as PCBs and DDT also caused populations to fall. By the 1970s, there were just 1200 breeding pairs left. Frans Schepers says: “What actually happened is the fertility of these birds completely crashed and there were actually laying eggs and would start to sit on them to breed, and the eggs just cracked so reproduction failed.“Better protection again here, but also cleaning up and not allowing anymore these chemicals to get into the systems actually made the White-tailed eagle come back.“So we’re now around 11,000 pairs in Europe, which is a comeback from 1970 up to now, which is spectacular.” Igor Chestin from the Russian branch of the World Wildlife Fund says the end of the Soviet Union caused mass migration from rural areas to cities, allowing agricultural land to return to the wild: “Inefficient agricultural production has vanished – it wasn’t competitive – so much of the rural land became basically empty. 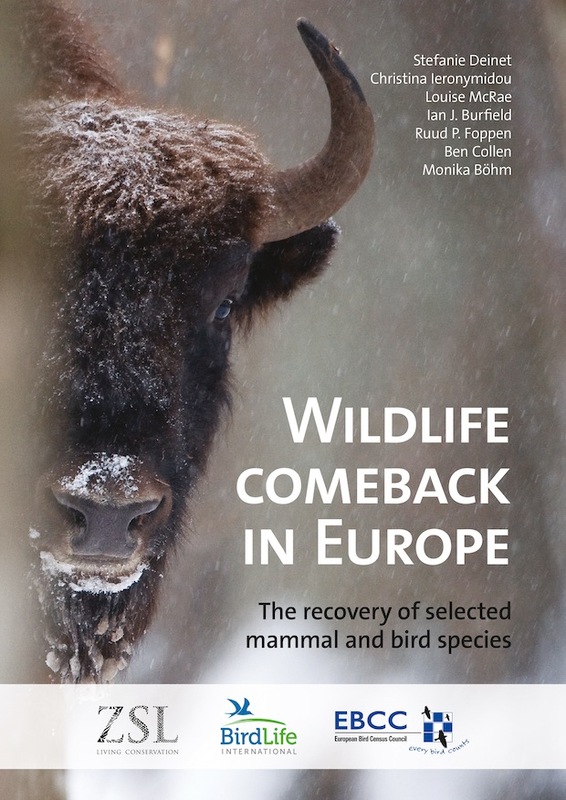 “It was taken by forests and some regions increased their coverage of forest by 10 times in the last 20 years.“Which of course resulted in the number of animals coming back.” And one of those animals was the European bison, writes Voice of Russia UK in “European wildlife making a comeback”. 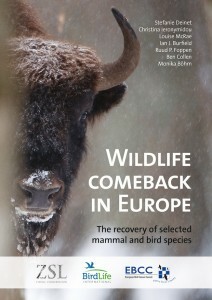 Wildlife Comeback in Europe is covered also by Le Monde, Al Jazeera, ABC Radio (Australia), Radio FM 4 (Austria), Associated Press, Agency France Press, Daily Express, The Telegraph, Daily Mail, De Volkskrant (Netherlands), Dagens Nyheter (Sweden), A-Magazinet (Norway), Christian Science Monitor, WWF, ZSL, BirdLife, EBCC and in numerous websites. See also publications in Croatian (T- Portal), Romanian (WWF- Romania, Romania TV), Portuguese (NaturLink, ATN), Bulgarian (Vesti, NTG website), etc. More articles are expected in Der Spiegel, La Stampa, Berliner Zeitung.